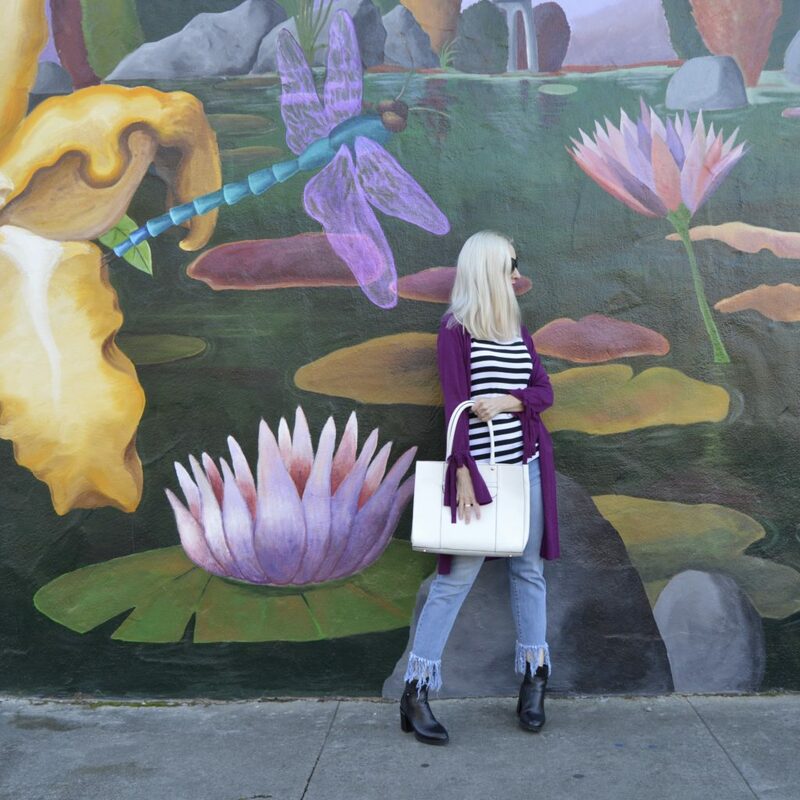 Shades of violet, raw distressed hems, abalone/black pearl jewelry, white bags, and stripes (oh so many stripes!) are all on trend for spring 2018.
as my look of the week! How’s your January shaping up, Dolls? I’ve had New York Fashion Week on my mind … it starts in 12 days! It’s such a gorgeous color, Dawn!! I think it’s one color I do have some of already in my closet—yippee!! What a wonderful gift! That color is gorgeous on you – stunning with your blonde tresses! That’s a lovely purple cardigan, what a nice shade, and lovely gift from your friend! I’m pleased to see stripes continue to be big, I love striped pieces! Hope that you are having a good week so far! It’s Australia day today, so a public holiday which is nice, we can get some more family time in! 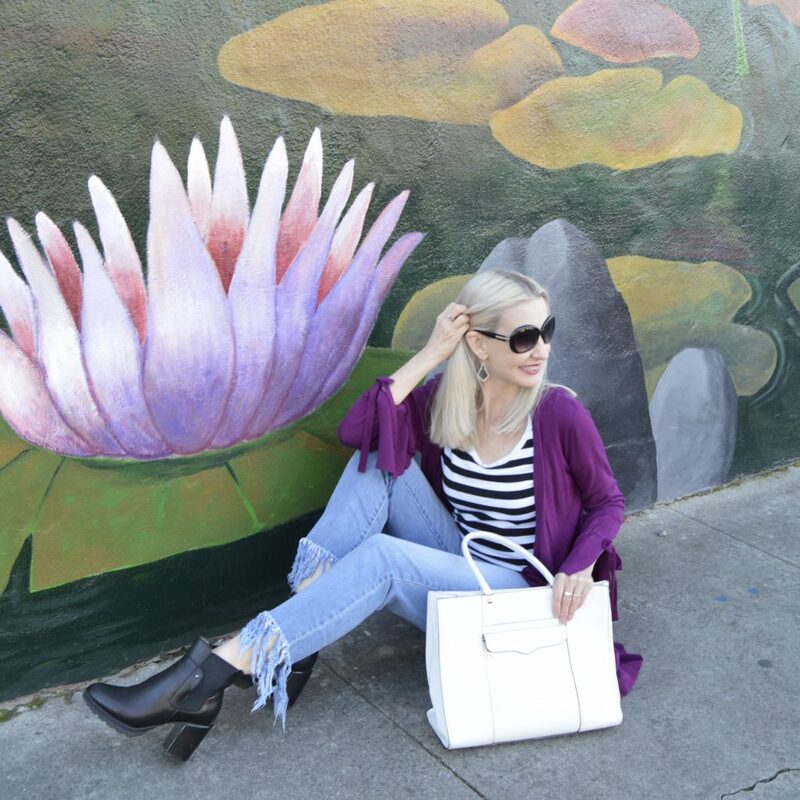 Fabulous cardigan! Have a good weekend! A white bag has been on my wishlist for a little while and this outfit is the perfect example of why it’s on my list! 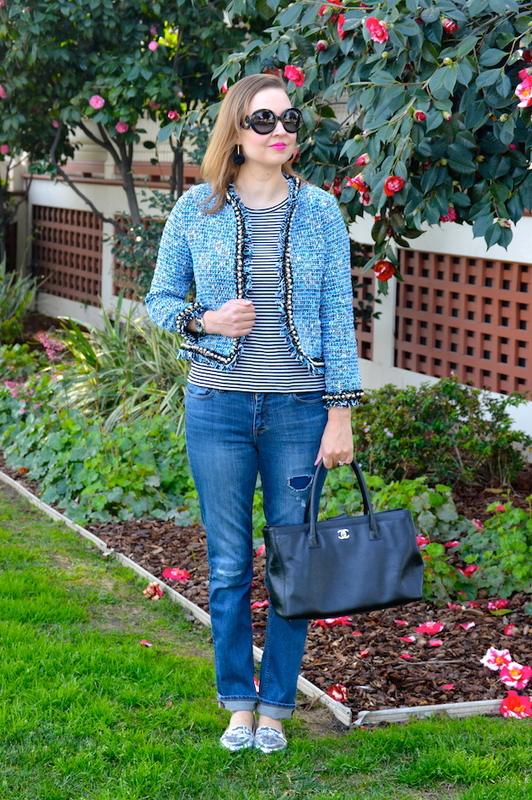 Love how it stands out and works so well with this gorgeous cardigan. What a nice gift! Woohoo loving violet on you! Makes me smile you pretty babe! Dawn Lucy, the tie detail on the sleeves is so adorable! And that shade of purple really is brilliant on you. Such a fun and energizing outfit! I adore it. Love how you’ve pulled these into one look and so wearable. Love this shade of violet on you! Thanks for hosting and featuring me in today’s post! Lynn did a good job! The color and the sleeve detail are gorgeous! This color is stunning! I love it mixed with the black and white stripes. Thanks for the link up! That violet looks great on you!! Love everything about this and your background couldn’t be more perfect!! I love the purple cardigan! Ultra Violet is your color, Dawn! You are going to have a great year with this being the signature color! Thanks for the link up and have a wonderful weekend! Great mural and I love your jeans! I almost drool over the color of your cardigan. It is going to be such a fun color for spring! Beautiful post! Such a fun and Pretty look! I love the beautiful color of your cardigan. Love the tie sleeve detail and such a pretty color on you. love the jeans too! 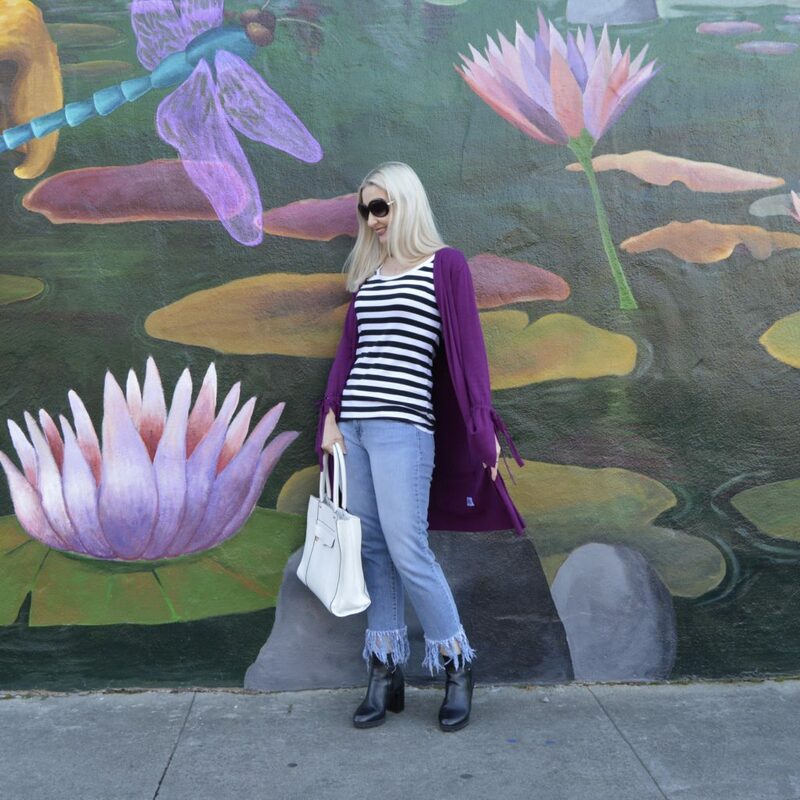 I love seeing all the different ways bloggers are wearing ultraviolet—the rich color of your cardigan is so pretty! 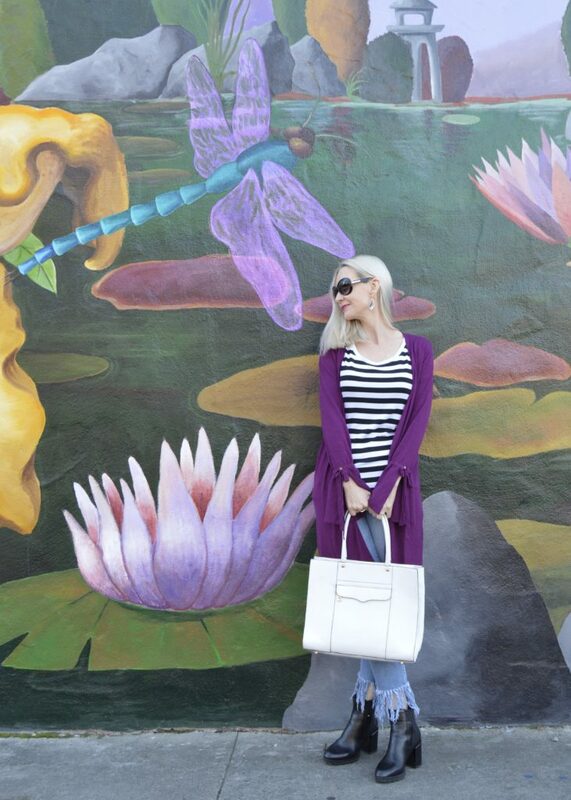 Love the pop of color the cardigan brings to your look. Love the jeans and sweater, and your photo shoot is beautiful!! As a former English teacher and administrator, I applaud you taking on this blog to showcase your creative side!! Way to go! Love the cardigan! Gorgeous color on you! I love the colour of your cardigan, and the sleeves are so pretty. What an amazing wall for a backdrop! I love this look! That sweater is so pretty, and I so want a pair of those jeans! I’ve had a hard time finding jeans like that short enough for me! You totally lucked out finding that wall for a backdrop!